Are you interested in deepening the love you share with your spouse or significant other? Do you want to learn how to become more loving? Do you want to learn how to approach those that seem unlovable? Do you feel you something to learn about love? I unlike many single people on this planet love Valentine’s Day. I can say that now because it no longer resembles a reminder of a void in my life because of my marital status. It conversely is a great reminder of how important love in this world and how much more love we have to give to others. It serves as a great challenge to me each day, and I pray as you read on it might speak to you in a similar way. This season is also a great reminder of God’s love for the world and each and for us. 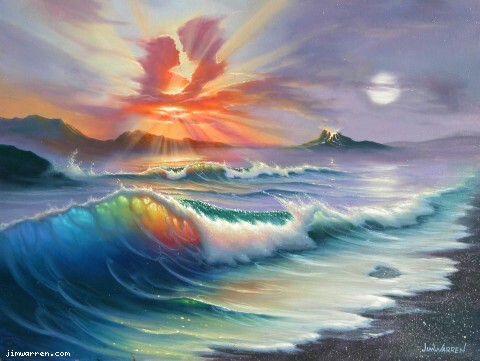 I love this photo that I used in this article from famous artist, Jim Warren. I believe it really captures the imagery of God’s love from heaven showering down and affecting the currents of our Earth that can resemble the stories we face in life both small and large. He has spent decades bringing to life spiritual, inspirational and whimsical themes that describe powerful imagery. I personally own one of his pieces and it hangs over my bed each day as an encouragement to my journey one day to heaven as my last breathe expires on Earth and I rejoice in my future with my personal Lord and Savior, Jesus Christ. This article is definitely not merely for the single readers, it is for all humans who choose to have ears to listen. For those who are married, I pray it would show you something new about love through God’s eyes that you apply to your marriage, family and relationships. For those who are single I pray it would pay dividends to how you approach the continued journey of your season of singleness so you can grow and abound in love. This article in truth is a follow-up article to one I wrote in 2009 called Leading Your Heart, however I believe this one speaks to a wider audience and digs deep to the core of what love truly is through God’s eyes. Love certainly is not what most of our American culture wants to show or believe in today. Sadly, so many believe love is only shown in what another person does for them, or how well they meet their needs and expectations of them. Many times our world measures how loving their spouse or significant other is by the standards of idolized relationships that set on the public stage. These seemingly model relationships that are commercialized through movies, books and the like are shown through media to be something desired but in reality rarely attained. It is like the airbrushed supermodels that young girls are looking up to now not realizing that those superstar figures do not look consistently as they appear to the world they sell to. What is love? How important is love? Where does the ability to give and receive love come from? These are all good questions to ask even more so during the Valentine’s season. Not because this season resembles love in our culture. I say this because I believe that many people misunderstand what true love is. Media and advertising tell us love comes through candy, flowers, jewelry, chocolate, teddy bears, dinners at fancy restaurants and other gifts. These things are not bad and might be a very genuine act of love, however this is not full expression of what love truly is. My goal today is encourage you about how God views love, shows it and desires us to express it during each of our days we are granted life. In reality much of scripture talks about love through God’s eyes. 1 Corinthians Chapter 13 however is a great chapter in one of the new testaments that are known by many because pastors from around the globe use it many times in wedding ceremonies. If you haven’t read it recently or never have, I would strongly encourage you to. Below however is an extraction of some of the verses and highlights of how God views true love and how he encourages us to see things in this journey we call life. First of all, I think it is vital to keep in perspective one fact: We are not even guaranteed life tomorrow. So why don’t we live with deep love today? This easily overlooked or avoided reality can affect how we approach life each day and how our ability to give and receive love occurs. If men can learn how deeply important unconditional love is to a woman, and reciprocally women can learn how deeply important unconditional respect is to man I believe that our relationships can soar to new heights. There is a wonderful website by Dr. Emerson Eggerichs called Love and Respect that I encourage you to visit for more on this concept.If you look at the list above again and think about the closest relationships in your life I believe you might just see some room to grow and improve in giving and receiving love. We will not toss in past failures of the other person in the course of an argument. As we celebrate the Valentine’s season, I pray that we would look beyond candy hearts, chocolates, flowers and cupid. I pray we would realize that no matter how difficult life might seem at times, and no matter how unlovable we feel or act towards others at times, that God’s love is unconditional and he deeply desires us to receive it freely from him each day…. I also want to thank my senior pastor, Steve Cornell of Millersville Bible Church, for helping provide support resource for this article. I help my coaching clients focus on matters like these so they can achieve better balance professionally and personally so they can see their business truly work to support their life purpose and vision. I also help coach them to see their business become more efficient, profitable and scalable, if desired. If you want to find out more about how this could be leveraged in your world, or if you want to discuss a business problem you are facing, feel free to contact me or call me at 717-615-2274.You are also welcome to share this article or other resources found on my blog (www.livewithpurposecoaching.com). Feel free to contact me if you or an associate would like to join my blog or receive this article as a PDF. Posted in Marriage, Love & Family, Spiritual Insights and tagged God's Love, Love, Marriage, Marriage & Family, Valentine's Day on February 12, 2010 by joesharp.